Tom Philabaum is well known as one of America's foremost glass artists, with exhibits throughout the Western world. His gallery showcases and justifies this reputation with examples of his own work, also exhibiting over 100 other nationally and internationally celebrated glass artists. 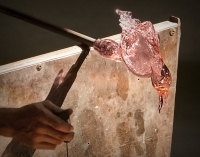 Aside from viewing the extraordinary exhibits, visitors are also welcome to watch glassblowing in progress and learn more about the craft in the studio. The gallery has been a great favourite on the Tucson art scene for more than 30 years and travellers interested in art will relish a visit to this creative gallery. It is also an exciting place to buy souvenirs.